Chipotle Ranch Chip Dip is a spicy southwest twist on everyone’s favorite taco dip recipe! 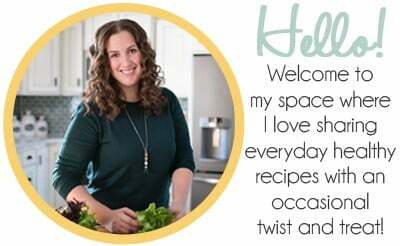 This easy 15 minute snack is full of fresh vegetables and a zesty sour cream and cream cheese spread. 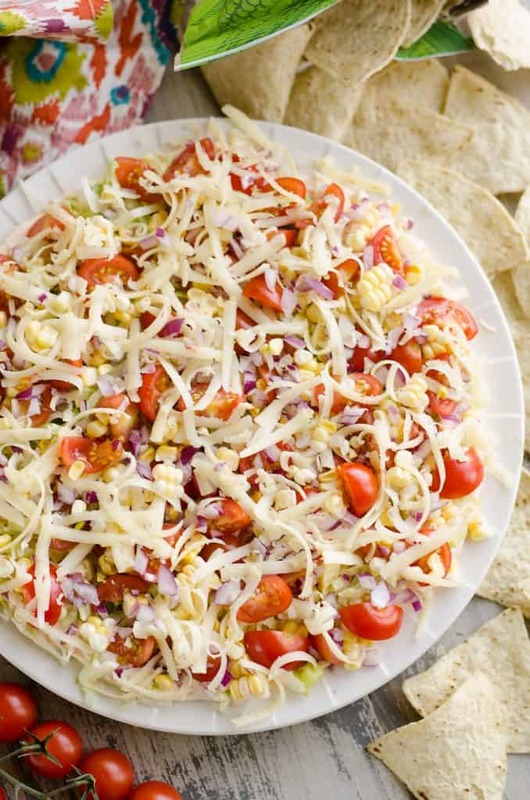 Everyone I have ever met loves the classic Taco Dip Recipe that our family and so many others make for parties and cookouts. This Chipotle Ranch Chip Dip is a spicy southwest twist on the original and I think it might even be better if I do say so myself! 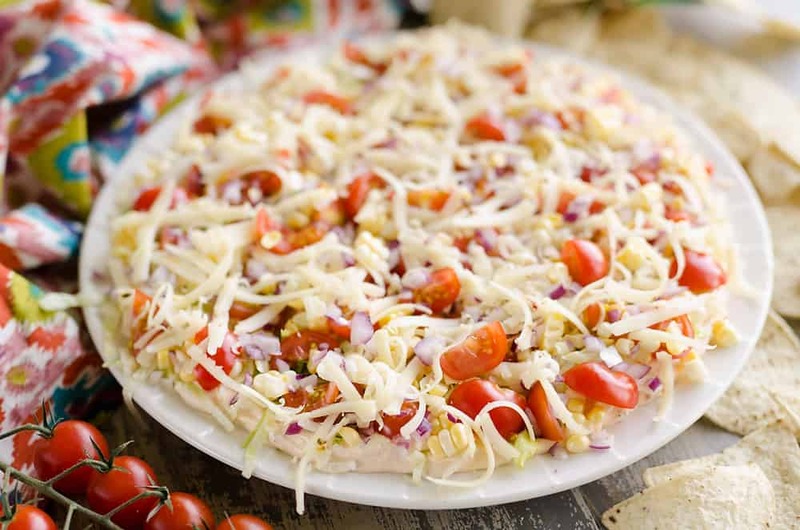 A mixture of sour cream and cream cheese is blended with chipotles in adobo and ranch seasoning. 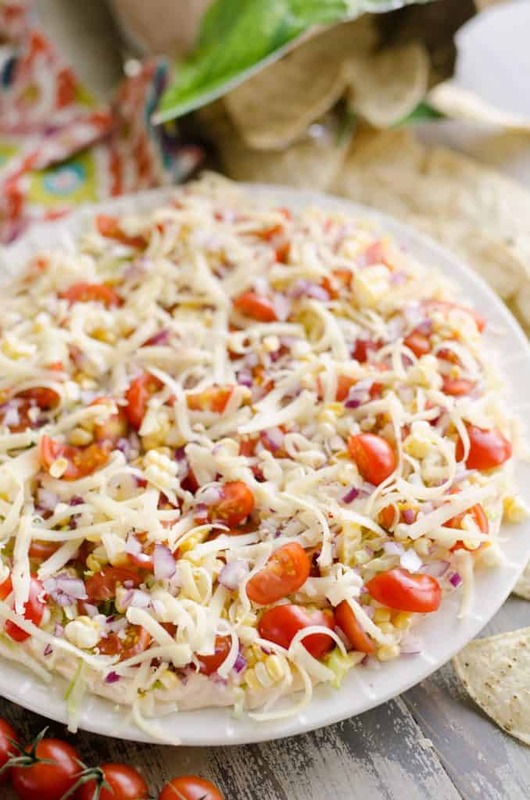 This is topped with fresh lettuce, tomatoes, sweet corn and shredded pepper jack cheese. The sweet corn is what really puts it over the top for me. 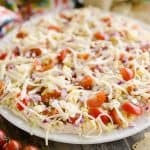 It is the perfect balance of sweet and spicy with the hot chipotle peppers and the sweetness from the corn and tomatoes. You can adjust to your spice preference with how many chipotles you add to the mix. I like things relatively spicy, so I opted for 2 chipotles. If you think medium salsa is too spicy, then you might want to opt for just one. When using chipotles in adobo sauce, rarely do I ever use a whole can, much less a half of can. One or two of those bad boys go a long ways. Instead of wasting all the leftovers, chop them up finely and put them in a freezer resealable bag. Lay the bag flat so it’s a thin layer and when you need chipotles for your next recipe, like these Chipotle Shrimp Tacos, you can just break off a piece from the freezer! Another component to this dish that I wouldn’t skimp on is freshly shredded cheese. There is just something about the creamy cheese shredded right from the block that is a million times better than the powdery store bought shreds. Obviously we all use those in a pinch when we don’t have a lot of time, but if you have the extra couple minutes, definitely shred your own cheese!. 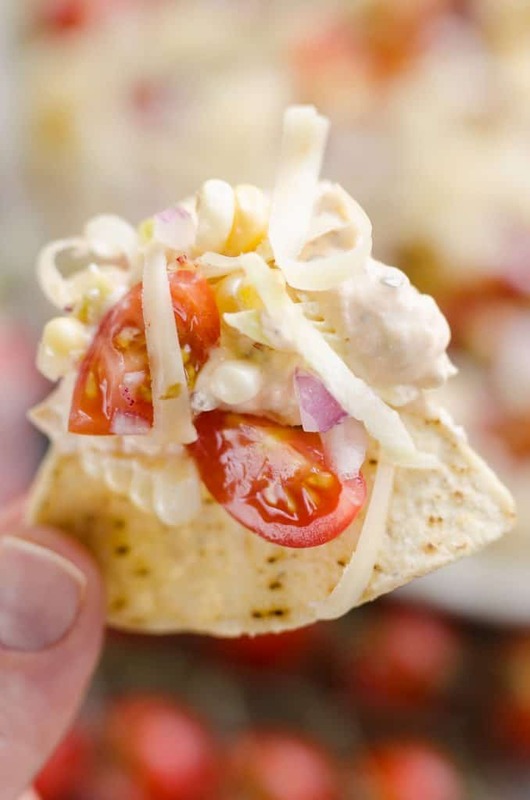 This Chipotle Ranch Chip Dip is going to be one of my new go-to recipes for an easy appetizer or snack to bring to a party or serve guests during the summer. It is absolutely perfect for whatever you are doing this Memorial Day weekend! Chipotle Ranch Chip Dip is a spicy southwest twist on everyone's favorite taco dip recipe! 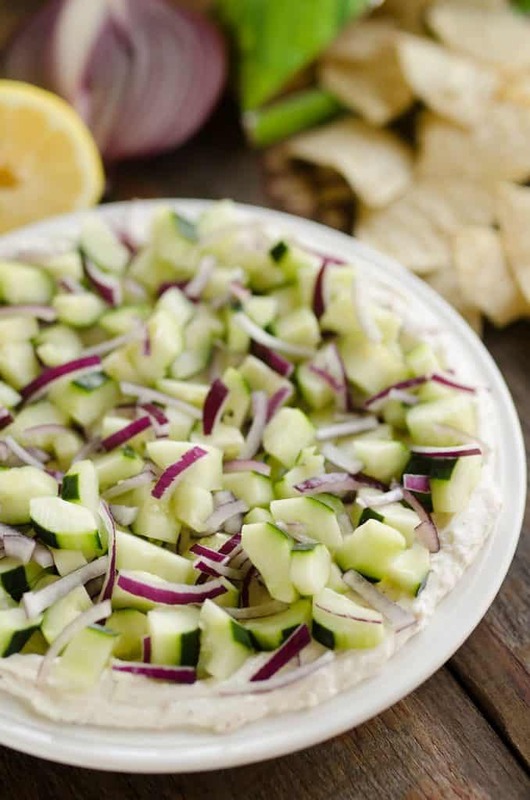 This easy 15 minute snack is full of fresh vegetables and a zesty sour cream and cream cheese spread. 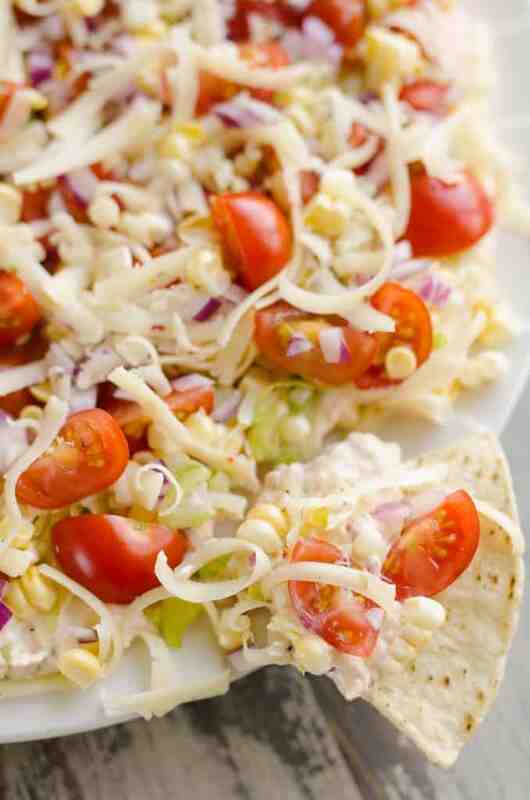 In a food processor or a medium bowl add the sour cream, cream cheese, ranch seasoning and diced chipotles. Blend until smooth. Spread the mixture over a large plate or platter. Top with the remaining ingredients. Serve fresh or store covered up to 6 hours before serving. 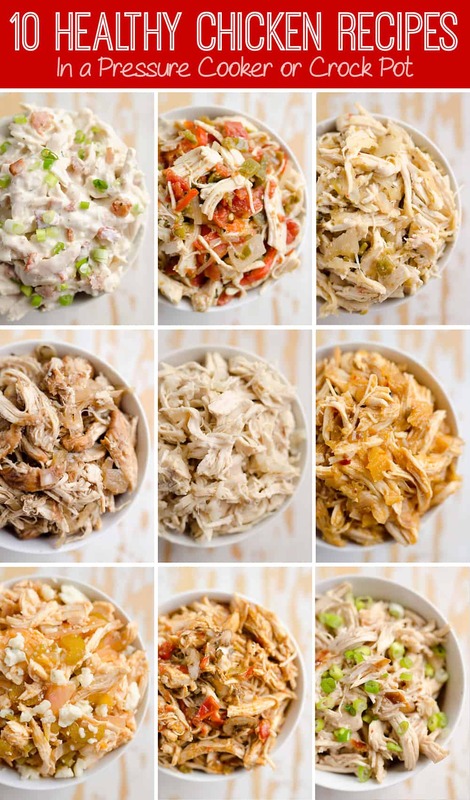 More delicious chip dip recipes! Ok- This looks AMAZING!!! I am adding this to the menu for our Memorial Day weekend at the lake!!! LOVE it!!!! This looks amazing!!! I have to agree that freshly grated cheese is the only way to go!! Oh man! I love chipoltle! 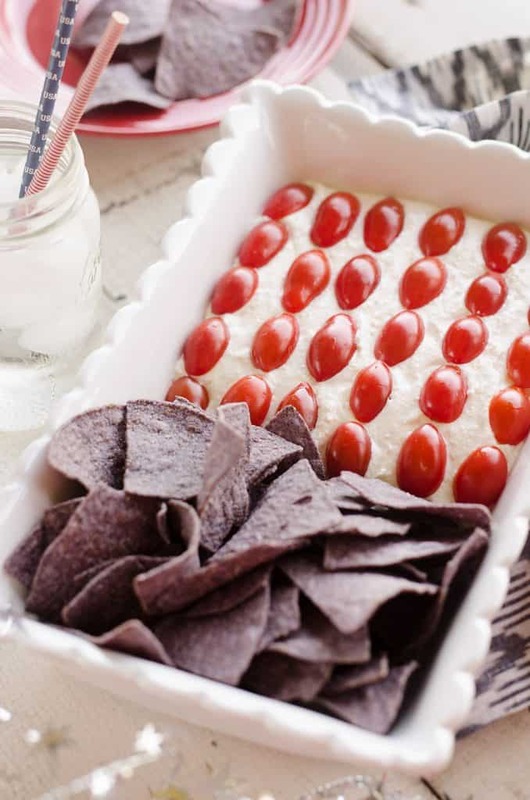 I’m totally going to have to try this dip!